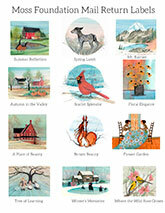 A beautiful and fun way to show your support for the Foundation is through the use of Moss mail return labels. 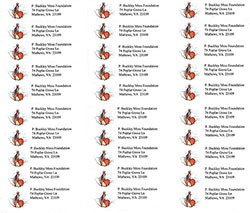 To order these beautiful mail return labels, please contact the Foundation office with your request. We will print and send them to you. Many of your favorite Moss images are available to choose from. Take a look! We print a total of 2 sheets of labels. You may choose 1 or 2 images. It's up to you! Although the labels are no-charge, we ask that you consider giving a $15 donation to the Foundation.